KartRocket is a SaaS based e-commerce platform that offers a transparent and complete e-commerce ecosystem that helps SMBs to create their online store in a few steps. KartRocket offers responsive design templates, marketplace integration, over 15 payment gateway integrations, fully automated shipping and fulfillment, and more than 150 features and apps to support an e-commerce website. Currently, they have more than 2,000 e-commerce stores and 2 million images on their platform. KartRocket had initially started with storing original and cached (derived) images on their server directly. Very soon they realized that disk space is not scalable across web servers and presents a severe problem at scale. The team then decided to host their images on Amazon S3. While the new solution worked, it created a new problem - one of derived images. For the PHP application to generate 4 or 5 resized versions of an image, it would first need to download the original image to disk, make the resized images, send them back to S3 and then delete the locally created images. Sounds pretty straight forward? At scale, this didn't work well at all. KartRocket immediately realized they needed a more robust solution - and found Cloudinary. Delivered by Akamai, the only CDN in India with around 90 point-of-presence (POP) locations. The nearest competitor is AWS Cloudfront, with only two. You can only imagine the benefit this has had on page load times and end-user experience. The quality of the images being rendered can now be dynamically controlled, passing a simple parameter "q_x" into the URL, and modifying the rendering quality for small thumbnails, large banner images and main product images. This dynamism has led to crisper and better quality images. As Saahil Goel, KartRocket's Co-Founder said: "Being a SaaS platform ourselves, we were initially very hesitant to 'outsource' a key piece of our product - but very quickly realized the obvious benefits. Cloudinary offers superior support and service, Akamai as a CDN and is clearly the most well established in the market." KartRocket currently host over 2 million images with Cloudinary and "couldn't be happier". Keeping in mind the need and importance of high quality images with faster load time, KartRocket’s clients enjoy Cloudinary’s superior benefits and capabilities, like dynamic image resizing services for free. 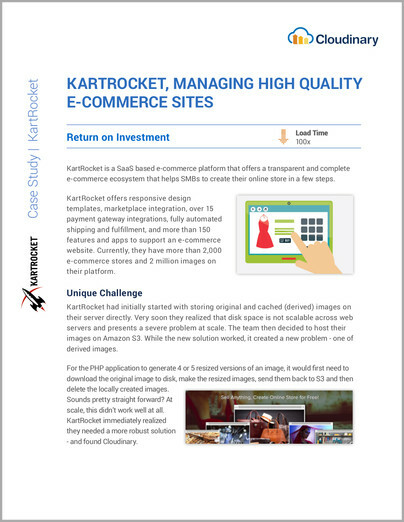 With Cloudinary, KartRocket's customers experienced a 100x increase in response time for their image loading times. We are happy to have KartRocket as our clients, and even happier that we managed to simplify and improve their user experience so dramatically. Does your company also have an interesting use case of Cloudinary and would like to be featured? Drop us a line, we would be happy to hear!